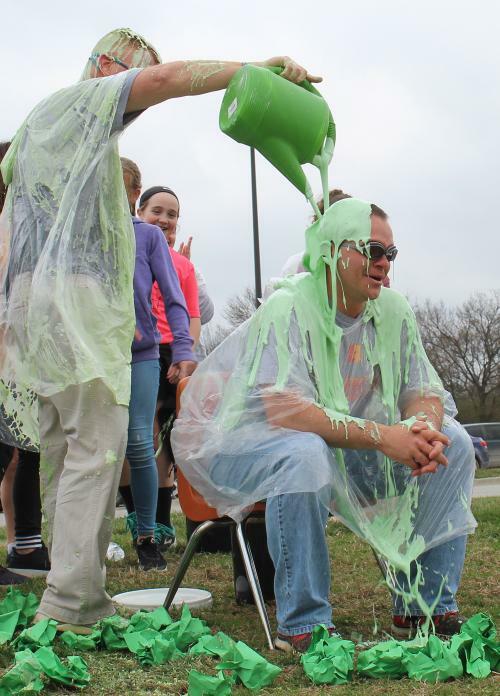 The annual food drive at Chanute Elementary morphed into a class competition, numerous acts of kindness and an extravagance of slime that surprised students and participants. The best part was that no one, students or principals, knew who was going to “win” the competition and be the victim of “sliming” by students at Friday’s assembly, said Communities in Schools coordinator Rachel Harrington. Even she and fellow CIS Coordinator Angie VanLeeuwen didn’t know the winner until noon Friday after CHS leadership students finished tallying up the 1,855 non-perishable items deposited in the three principal’s offices. They were prepared, though, with 35 gallons of green slime they began making Thursday, using an online recipe and doctoring it with a few extra ingredients. In addition to 70 pounds of flour and 42 boxes of lime Jell-O, Harrington added some dish soap, shampoo and then shaving cream. The competition intensified after Koester suggested stuffing each principal’s office with the donated items. Grades 1 and 2 took their donations to Koester’s office, grades K and 5 to Principal Noel Shinkle’s office, and grades 3 and 4 to Principal Eric Hoops’ office. 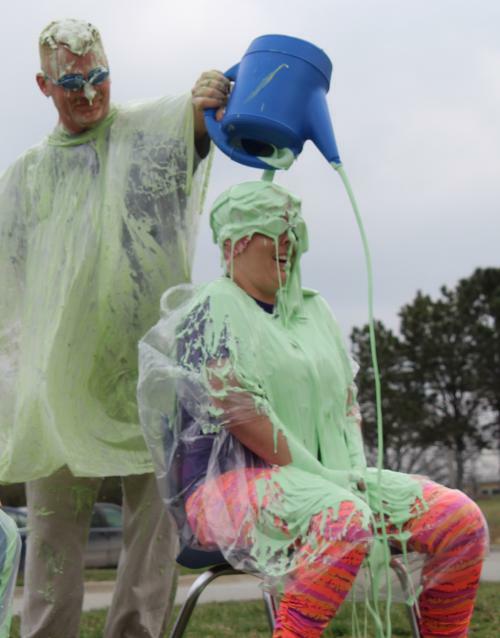 The students whose principal received the most items would each get to pour a cup of slime on the principal. Shinkle came up with the idea of giving “Can Be Kind” cards to students who showed an act of kindness to someone at school. The students receiving a “Kind” card were allowed to steal an item from one principal’s office and put it in another principal’s office. There may not be as much food as in past years, “but there was a whole lot more kindness” with this year’s drive, VanLeeuwen said. 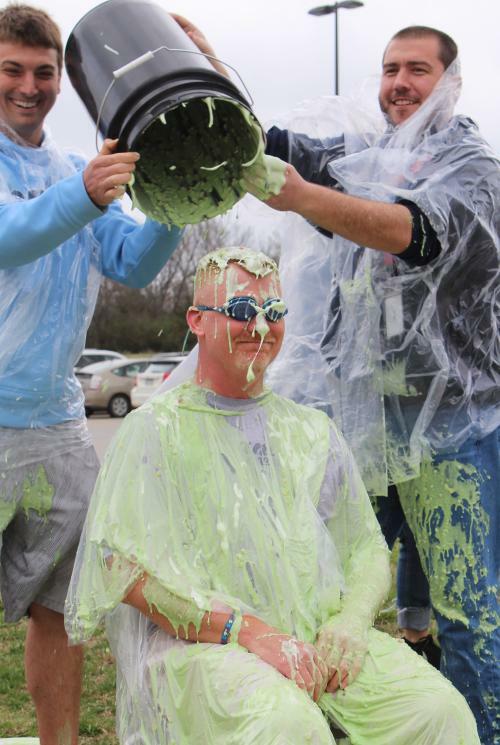 At the assembly held in the north parking lot, staff and students watched Koester get the full bucket of slime dumped on his head while Hoops and Shinkle were showered in green paper. 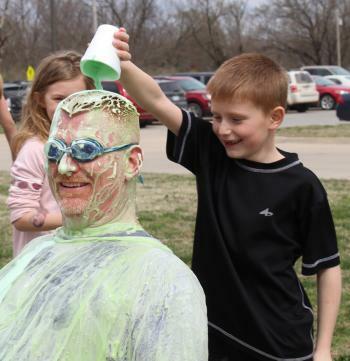 Then to everyone’s surprise the CIS coordinators presented Koester with two pitchers of additional slime to “share” with his fellow principals, since the food drive was a team effort.